it’s time to get down to making those cards for Christmas ! 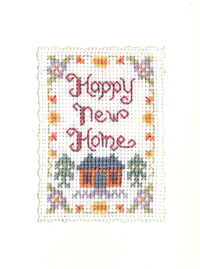 A Happy New Home card for someone who is on the move; with subtle metallic colours with antique green. 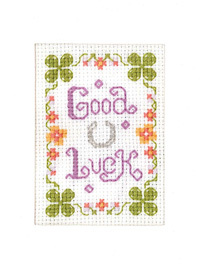 The mini Good Luck card sends good wishes for any occasion and has good luck symbols of silver horseshoes and four leafed clover. 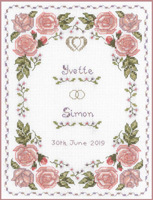 The kits have top quality materials and a beautifully clear chart with both colour and symbols, and full instructions including the how to mount the card. 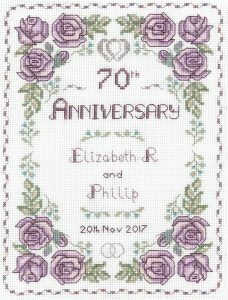 A 100th birthday cross stitch card – more of us are privileged to know someone who reaches a 100th birthday these days ~ what better way to mark it than with a card to keep ! 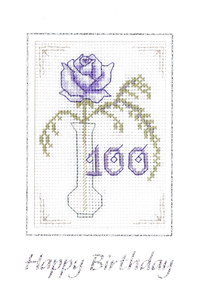 This card is in gentle mauves and blue with a twirly ‘100’ ! The Royal Platinum Anniversary is on 20th November 2017 ! Queen Elizabeth & Prince Philip celebrate an amazing 70 years of marriage. A Welcome Sampler to greet your guests on arrival at your home. This welcome sampler would be great in your home or a Bed and Breakfast ! The sampler is a sizzling composition in warm pinks and mauves. The whirls and swirls dance around small flower motifs to create lovely panel. 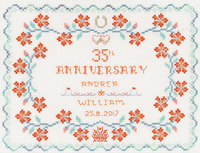 This is a new range of Coral Wedding Anniversaries to celebrate 35 years of marriage. 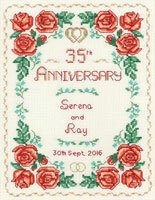 This range includes two samplers and two greeting cards for this special event. The range draws on the sensational colours of deep sea coral reefs in vibrant coral reds and pinks with contrasting turquoise. 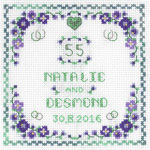 April 2016 – a versatile cross stitch birthday card in delicious plums and pinks. You can add either a “Happy Birthday” or any age to go with the name. 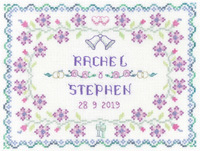 a new Amber Wedding Anniversary Sampler in fresh Spring colours of amber and amethyst on 14 aida. 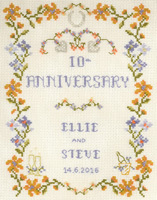 This lovely sampler is easily adapted for any anniversary year. 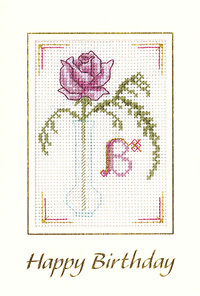 The sampler has a luscious floral border with glistening beads in amber, blue and cream. Silver threads and glitz to the horseshoes; the design also features champagne bottle and flutes. 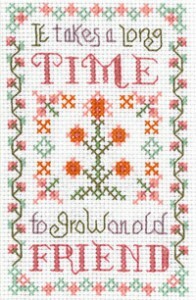 mini Traditonal Sampler and mini Sampler for a Friend which would make a lovely gift to stitch for a valued friend. A new christmas card to add to the collection ! …. A christmas tree with glistening baubles. 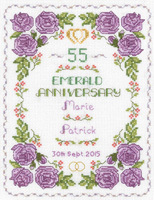 All new range of Emerald Wedding Anniversaries to celebrate 55 years of marriage. 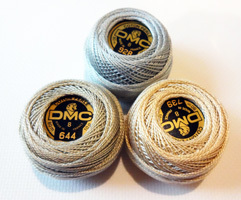 There are 3 samplers of various sizes and 2 greeting cards to suit any requirement in mauve, purple and sizzling greens in keeping with the emerald gemstone which is the basis of the collection. Decorative Samplers is a range of samplers and greeting cards for special occasions which provide a neat fit with the Lifetime Samplers existing range. This has provided an exciting and refreshing development to reinvigorate Lifetime Samplers …. so watch this space for new designs and developments.